Sulfur hexafluoride is a non-toxic inert gas that is widely used for insulating and cooling applications in the electric & power industry owing to its superior thermal stability and excellent dielectric strength. Sulfur hexafluoride has key applications in electric power transmission and distribution systems such as gas insulated switchgears (GISs), circuit breakers (CBs), and load break switches due to its electrical insulation property and arc interruption capability. The product has applications in power & energy, metal manufacturing, and electronics industries. The sulfur hexafluoride is an excellent electrical interrupter due to properties such as high dielectric strength, high thermal stability, high density, low heat transfer, non-toxic, and chemically inertness. In terms of grade, the global sulfur hexafluoride market has been bifurcated into electronic and technical. The technical grade segment accounts for a significant share of the market due to its key applications in high voltage and medium voltage circuit breakers and switchgears devices. The grade has purity of 99.9%.Electronic grade of sulfur hexafluoride has purity grade of (>99.999%). It has applications as an etching agent in plasma processing of semiconductor manufacturing industry. Sulfur hexafluoride gas is utilized in leak detection applications and as a gaseous dielectric for circuit breakers, transformers, and condensers. Moreover, sulfur hexafluoride gas has applications in the semiconductor industry, as an effective etchant. Electrical transmission and distribution is a major segment of the global sulfur hexafluoride market. Sulfur hexafluoride is extensively employed in electrical transmission and distribution applications such as circuit breakers and switch gear devices. Direct substitute, having similar dielectric strength and nontoxic properties, of sulfur hexafluoride is unavailable in the market. In terms of volume and value, the technical grade segment accounted for market share of 60% in 2017. It is a rapidly expanding segment of the market. Growth of the electricity sector to cater to ever-increasing demand for electricity across the globe drives the market. Improvements in electricity production due to high demand from residential, commercial, and industrial segments is likely to fuel the sulfur hexafluoride market during the forecast period. Rising demand for homes and infrastructure due to rapid increase in population in countries such as India and China has propelled the need for power utilities. This, in turn, is anticipated to drive the demand for sulfur hexafluoride in the electrical transmission & distribution segment during the forecast period. High demand for end-use applications from the semiconductor manufacturing industry is increasing in countries such as Taiwan, South Korea, Malaysia, and Thailand. This, in turn, is projected to fuel the sulfur hexafluoride market during the forecast period. Sulfur hexafluoride has a greenhouse potential (GWP) of 23500 for 100 years. It is a key greenhouse gas; therefore, regulations have been implemented in the international policy to regulate its emissions. Sulfur hexafluoride was included in the 1997 Kyoto Protocol. According to this protocol, many countries mainly in North America and Europe are imposing stringent regulations on emissions of greenhouse gases. Rising environment-related concerns and increase in the number of regulations and their strict implementation are hampering the usage of sulfur hexafluoride across the globe. In terms of volume, Asia Pacific constituted more than 40.0% share of the global sulfur hexafluoride market in 2017. China is a major country for the sulfur hexafluoride market. Various key players and unorganized local players are operating in the country. Based on demand, China constitutes a prominent share of the sulfur hexafluoride market in Asia Pacific due to rapid urbanization, which is increasing the need for power utilities in the country. Sulfur hexafluoride is likely to be phase-out in the near future due to its high GWP value. However, a direct alternative for SF6 in key applications such as medium voltage switchgears is not commercially available Hence, the market is projected to expand at a sluggish pace during the forecast period. The market in Latin America is estimated to expand during the forecast period due to the growth of the magnesium production industry in countries such as Brazil. The market in North America, Europe, and Asia Pacific is projected to expand at a rapid pace, while that in Latin America and Middle East & Africa is anticipated to expand at a sluggish pace between 2018 and 2026. The global sulfur hexafluoride market is fragmented with the presence of regional and local players. For instance, Solvay offers sulfur hexafluoride reuse program worldwide, which offers reclaiming of used sulfur hexafluoride gas, analytical services for used sulfur hexafluoride, packaging and transport of used sulfur hexafluoride, and environmental consultation. Prominent players operating in the market include Solvay, AGC Chemicals, Kanto Denka Kogyo Co., Ltd., SHOWA DENKO K.K., The Linde Group, Air Products and Chemicals, Inc., Air Liquide, Axcel Gases, Fujian Shaowu Yongfei Chemical Co., Ltd, Concorde Specialty Gasesc, Shandong Ruihua Fluoride Industry Co. Ltd, and Wuxi Tianzhi Chemical Technology Co., Ltd.
Based on application, the electrical transmission and distribution segment held a major share of the global sulfur hexafluoride market in 2017 owing to the increase in electricity consumption, led by increasing demand for electricity from residential, commercial, and industrial sectors. Rising demand for homes and infrastructure development, especially in emerging economies such as India and China has propelled the need for power utilities. This trend is likely to continue during the forecast period. In terms of value and volume, Asia Pacific accounted for a prominent share of the global sulfur hexafluoride market in 2017. The region is expected to continue to dominate the global market during the forecast period. China is a highly lucrative country for sulfur hexafluoride in Asia Pacific. Rapid urbanization due to rise in demand for power utilities in the country and presence of a well-established semiconductor manufacturing industry are anticipated to fuel the sulfur hexafluoride market in China during the forecast period. Demand for end-use applications in the electronics industry has been increasing mainly in countries such as Taiwan, South Korea, Malaysia, and Thailand. This, in turn, is projected to fuel the sulfur hexafluoride market during the forecast period. Sulfur hexafluoride is likely to be phase-out due to its high GWP value by developed nations in North America and Europe in the near future. However, a direct alternative for sulfur hexafluoride in key applications such as medium voltage switchgears is not commercially available. Hence, the market is projected to expand at a sluggish pace during the forecast period. This report analyzes and forecasts the sulfur hexafluoride market at global, regional, and country levels. The market has been forecast in terms of volume (Tons) and value (US$ Thousand) from 2018 to 2026, considering 2017 as the base year. The study includes market indicators, drivers, and restraints of the global sulfur hexafluoride market. It also encompasses the anticipated impact of these drivers and restraints on the demand for sulfur hexafluoride during the forecast period. The report also highlights opportunities in the sulfur hexafluoride market at global and regional levels. The report analyzes price trends and forecasts prices of sulfur hexafluoride at the global and regional levels. The report includes detailed value chain analysis, which provides a comprehensive view of the global sulfur hexafluoride market. Porter’s Five Forces model for the sulfur hexafluoride market has been included to help understand the competition landscape of the market. The report covers regulatory landscape that includes various regulations regarding the product across the globe to understand the various legal constraints that can affect product offering. The study encompasses market attractiveness analysis, wherein grade and application segments have been benchmarked based on their market value, growth rate, and general attractiveness. The study provides a decisive view of the global sulfur hexafluoride market by segmenting it in terms of grade and application. In terms of grade, the market has been segmented into technical grade, electronic grade, and others, which includes metallurgical and ophthalmological. 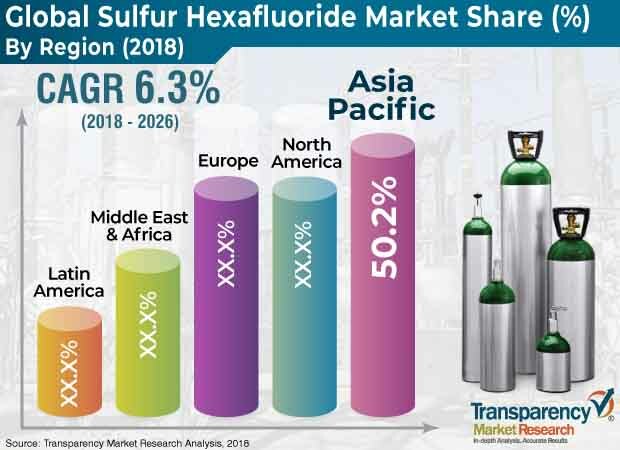 In terms of application, the sulfur hexafluoride market has been segregated into electrical transmission and distribution, semiconductor manufacturing, and others (including magnesium production and ophthalmological surgeries). Market segments have been analyzed based on the present and future trends. Regional segmentation includes current and future demand for sulfur hexafluoride in North America, Europe, Asia Pacific, Latin America, and Middle East & Africa. The report provides the actual value of the sulfur hexafluoride market for 2017 and the estimated market value for 2018 along with forecast for the next eight years. The size of the global sulfur hexafluoride market has been provided in terms of volume (Tons) and value (US$ Thousand). The market value has been provided for the global, regional, and country-levels. The report comprises profiles of major companies operating in the global sulfur hexafluoride market. The global sulfur hexafluoride market is fragmented with the presence of local and global players. Key players include Solvay, AGC Chemicals, Kanto Denka Kogyo Co., Ltd., SHOWA DENKO K.K., The Linde Group, Air Products and Chemicals, Inc., Air Liquide, Axcel Gases, Fujian Shaowu Yongfei Chemical Co., Ltd, Concorde Specialty Gases, Shandong Ruihua Fluoride Industry Co. Ltd, and Wuxi Tianzhi Chemical Technology Co., Ltd. Market players have been profiled in terms of attributes such as company overview, financial overview, business strategies, and recent developments. The report also comprises a matrix of comparison between the top two players operating in the global sulfur hexafluoride market along with analysis of business strategies.